Laxton's Superb is a classic English dessert apple from the Victorian era, still widely grown in gardens and small orchards. The apples have the orange/red flush which is characteristic of many English apple varieties. The flavour is basically sweet, and the flesh is firm rather than crunchy. All in all, a typical Victorian apple. One of the parents of Laxton's Superb is Cox's Orange Pippin, and it is often grown as a Cox-substitute. 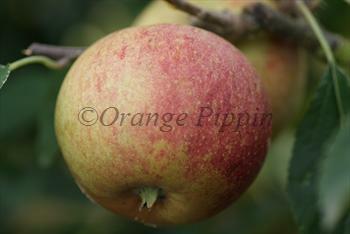 The appearance and flavour are quite close to Cox's Orange Pippin but the tree is hardier and better-cropping. Please fill in the details below and we will let you know when Laxton's Superb apple trees are back in stock. Sunset is a popular garden alternative to Cox, easier to grow, with a sweet aromatic flavour. Considered by many to be the best-tasting apple ever, Rubinette has a lovely balanced sweet / sharp flavour. A quietly popular Edwardian era Cox-style apple, developed by the Laxton Brothers Nursery. A modern red apple with an old-fashioned flavour. Cold hardiness: -30F / -34C? Laxton's Superb is in flowering group 4. Laxton's Superb is partially self-fertile, but fruiting will be improved if there is a compatible tree of a different variety nearby. Laxton's Superb is a good apple variety for the garden. It blossoms quite late which can be useful in areas subject to spring frosts, and the tree is fairly disease resistant (although it can be affected by scab). The tree is quite easy to identify (even without apples on it) owing to its weeping growth habit and long whippy branches. The main problem with Laxton's Superb is a tendency towards biennial bearing, which means it will produce a good crop one year and then hardly anything the next. If you notice this occurring you can alleviate it by deliberately over-thinning in the "on year", although many owners just put up with it. Laxton's Superb produces a strong-growing tree, and is therefore best grown on a less vigorous rootstock for smaller gardens. Developed by the famous Laxton Brothers nursery in Bedford, England, and introduced in 1897. A cross between Cox's Orange Pippin and Wyken Pippin.